Lifting up Longview for over 40 years..
Join us in 2019 as we celebrate our 42nd year of "Lifting Up Longview"
It's a world class event attracting the very best competitive pilots from across the United States and the world. In 2013 Gregg County was proclaimed "The Balloon Race Capital of Texas" by the 83rd Texas Legislature. 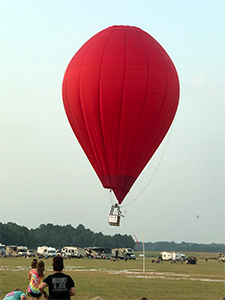 Balloon flights begin Friday morning with a flight over the City of Longview and continue each morning through Sunday over the East Texas Regional Airport. Launch and landing sites change each day as they are always determined by wind and the weather. Balloon Glows on Friday and Saturday night entertain crowds with an awesome display of color and excitement. It's one of the most popular things to do at the event as the public is able to get up close and watch how balloons are inflated and operate. Live concerts Friday and Saturday nights following the Balloon Glow extend the entertainment into the late night. Kids Land is a safe restricted area for children that requires a small separate entry fee. Activities and attractions differ from year to year but it is always a fun time. Vendors display their arts, crafts and other merchandise in booths lined up along an improvised midway. Food Vendors make sure there is always enough to eat and drink during the day and evening. In 1978, the Great Texas Balloon Race was born from an agreement between Dr. Bill Bussey, D.D.S., a world-record hot air balloon pilot, and Frankie Parson Riggins and Mary LeTourneau, Longview Mall managers. The Great Texas Balloon Race is Proud to announce our 2019 Event Musical Entertainment including East Texas sensation Koe Wetzel and Country Music journeyman Gene Watson. Tickets will go on sale March 27th at OuthouseTickets.com. Tickets will also be available at East Texas area Brookshires and Super 1 Foods closer to the Event date. Weekend passes will be available online!